Fall is here and Winter will be here before you know it. Here are a few things you can do to get your home prepared for the Winter months ahead. Ice dams can form at the gutter edge of your roof when interior heat causes the snow/ice to melt and refreeze. Once an ice dam forms, it blocks water from draining off the roof and forces the water inside of your home. Make sure your roof is properly ventilated and the attic is well insulated to minimize the amount of heat rising through the attic. Inspect your home for air leaks. 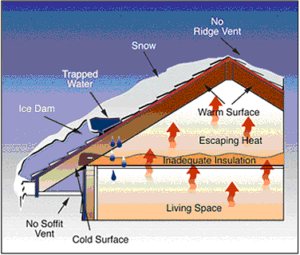 Warm air into the attic will create ice dams. Sealing those areas will limit cold air drafts inside and reduce energy bills as well as lower the chance for a dam to form. Older windows often come with drafts. 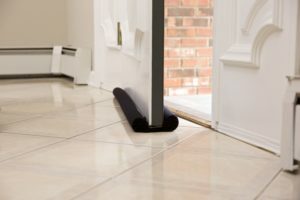 This will not only cause your heating bill to rise year after year but will allow for those pesky bugs to enter looking for shelter from the cold. Make sure your windows and the framing around them are properly sealed to minimize the potential for openings. Inspect your windows for damage. We tend to take these openings for granted but just like anything else, they to can go bad. Just like windows, doors often come with drafts. As time goes on there could be settling or any number of things that cause openings around your doors. Weather stripping or even a good door draft stop can make a world of difference. Inspect your doors periodically. As stated before, they too can go bad over time.